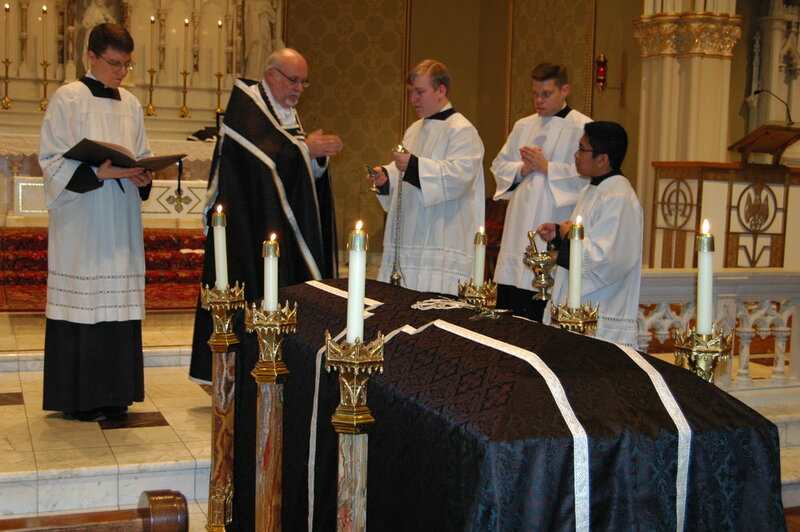 A Requiem Mass (also known as the 'Mass of the Dead') is a special form of the Roman Catholic church's standard service, the Mass, and is used when someone dies, to pray that their soul may Rest in peace (RIP). The latin word 'Requiem' means 'rest' and the service begins with the words 'Rest eternal grant unto them O Lord, and let light perpetual shine upon them'. As with the Mass, certain fixed texts from the order of Service are often sung, and over the years these have been set to music by a number of composers and are often heard within a concert setting as well as in Church services. Famous examples include those by Mozart, Verdi, and Fauré. In musical circles, the word 'Requiem' is sometimes used to refer to a musical setting. A number of composers, including Brahms, Britten and Howells, have created Requiems using different texts from those in the Requiem Mass: Brahms and Howells draw extensively on texts from the Psalms, while Britten, in his War Requiem, combines the words from the Requiem Mass with poems by the poet Wilfrid Owen, who died in the final year of the Great War.